Programme at Senate Square: 5 to 7 pm. On July 16th, Finland will host a summit between US president Donald Trump and Russian president Vladimir Putin. Finland is a peaceful country, known for its commitment to multilateral co-operation and peace. We will gather together to demonstrate that we in Finland are on the side of human rights, democracy, peace, environment and climate action. We want to defend a system based on multilateral agreements, rather than bilateral negotiation. We will not close our eyes, nor will we be silent. We invite you to join us for a peaceful, non-partisan gathering in defense of civil society and international cooperation in themes of democracy, human rights, peace, climate action and environmental protection. 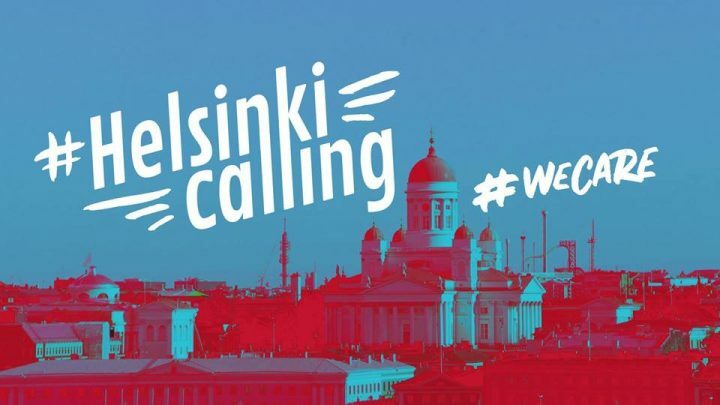 Together let’s make #HelsinkiCalling trend throughout the world and demand that these superpower leaders hear our concerns, and know that #wecare. In keeping with our values, we will not tolerate any expressions of discrimination, including visible logos of groups advocating discrimination; visible party political or national logos or symbols. This event is accessible, family-friendly, and drugs and alcohol are strictly forbidden. All participants must abide by Finnish law and regulations. We will gather in the Kansalaistori Square, from which we will make our way to the Senate Square, where we will hear speeches. The speakers list will be published later. This protest is being organized by a non-partisan alliance, Helsinki for Human Rights, which is made up of individuals concerned about the state of the world and representatives of civil society.